There are three types of boundary objects in MapViewer: polygons, polylines, or points. Data can be linked to boundary objects for use in thematic maps. You can draw these types of objects with the MapViewer drawing tools or you can import boundary files that contain these types of boundaries the File | Import or Map | Base Map commands. MapViewer includes a number of boundary files in the SAMPLES folder under the main MapViewer folder. 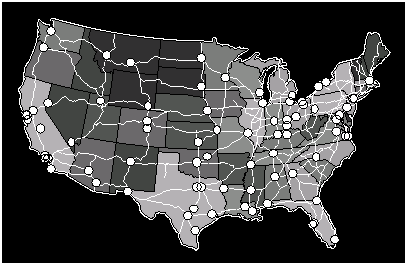 Boundaries include areas (states), curves (interstate highways), and points (cities). You can assign a primary ID used to link the boundary to data in a file, as well as other IDs (secondary, attribute 1, attribute 2, etc.) that can be used as additional identifiers for the object. You can also assign hyperlinks to link your data to additional information. Polygons, also referred to as areas, are closed boundaries. The beginning and ending points for the boundary are identical, forming a closed shape. A minimum of three vertices are required to form an area. Polygons can be assigned a fill color, fill pattern, and line style. Polygons can be drawn by selecting the Draw | Shape | Polygon command or using the Draw | Shape | Spline Polygon command. Polylines, also called curves, are lines drawn on a map to show features such as roads or streams. With maps such as bar maps, the thematic map object is placed on the curve's centroid. Polylines can be drawn by selecting the Draw | Polyline command or using the Draw | Shape | Spline Polyline command. Points show point locations on a map and are represented by a symbol. Points can be placed on a map using the Pin Map command, or they can be drawn using the Draw | Shape | Point command. Objects such as rectangles, rounded rectangles, ellipses, and text are not MapViewer boundaries so you cannot link data to these types of features. You can add these types of objects to any type of map as decorative features or you can use these objects to highlight regions on a map. However, if you need to use a rectangle, rounded rectangle, square, circle, or ellipse as a boundary, draw the shape, select it, and then use the Boundary | Edit Boundaries | Change Boundary Type | Symmetric Shape to Area command to convert it into a polygon boundary object.